We held this workshop in Dubai earlier this year. It was very well received and sold out with many radiologists wanting to register. 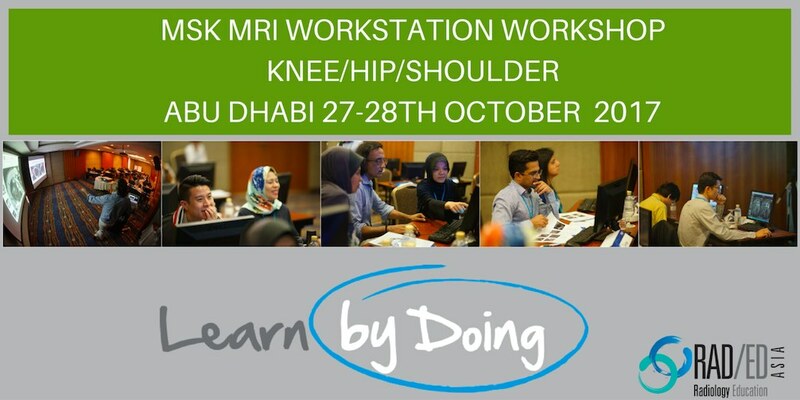 So we have decided to hold the workshop again but this time in Abu Dhabi and will cover MRI of the Hip, Knee and Shoulder. UPDATE 12/09/17 VENUE HAS BEEN CONFIRMED. We have confirmed the Sofitel Corniche Hotel as the venue for the MSK MRI Workstation Workshop in Abu Dhabi next month on October 27-28. This is a fabulous hotel on the Corniche and will be a great venue for the workshop. We are also commencing a Pre and Post Workshop Review Programme we call 3R ( Review, Refresh, Remember) which is complimentary as part of the workshop. One of the biggest issues with learning is forgetting. We all know the feeling of going to a meeting and then rapidly forgetting what we have learnt. So…Starting 1 month before the workshops we will send brief reads on topics that we will cover in the workshop. In this way when you get to the workshop, a lot of what you will learn wont be entirely new. You can focus your attention more on viewing the dicoms, and the presentations become a refresher of what you have pre read. 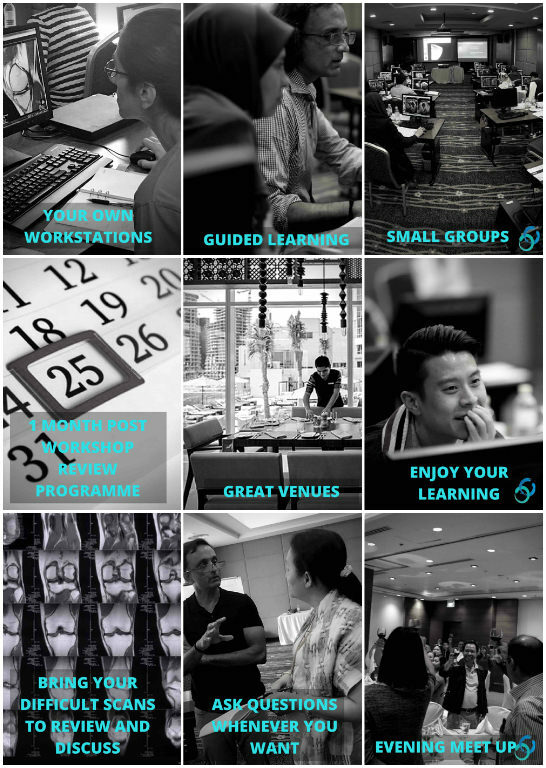 Combined with a 1 month post workshop review programme that refreshes your memory of what has been learnt, this will make a big difference to how much you learn and retain from the workshop. We have had radiologists from Singapore, Malaysia, Australia, India, Nepal, Indonesia, South Africa, Maldives, Mauritius, Laos, Vietnam, Myanmar, Seychelles, Afghanistan, Thailand, Bangladesh, Philippines, UAE, Qatar, Saudi Arabia, Kuwait, United Kingdom and Cambodia join our workshops and we look forward to you joining and meeting with you. 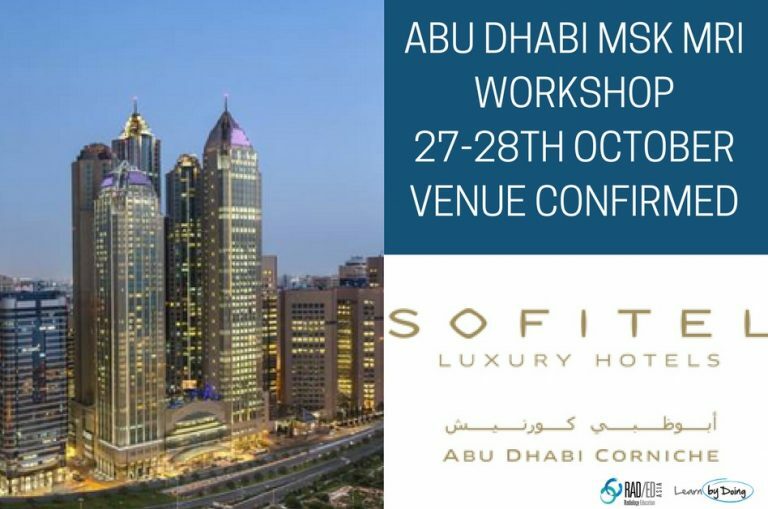 VENUE: We have confirmed the Sofitel Corniche Hotel as the venue for the MSK MRI Workstation Workshop in Abu Dhabi next month on October 27-28. This is a fabulous hotel on the Corniche and will be a great venue for the workshop. CME: We are in the process of applying for CPD points from HAAD and RANZCR. RCR will recognise the points awarded by RANZCR. The workshops are also eligible for recognition of the RANZCR points by DHA, HAAD and KIMS.